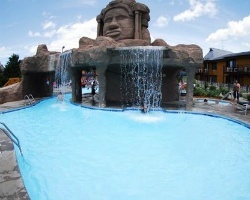 *Sanctuary Lodge at Splash Canyon* in Wisconsin Dells provides more than 200,000 square feet (60,960 square meters) of indoor and outdoor waterparks. The resort features a variety of accommodation choices including king rooms, queen rooms, two-bedroom suites and hot tub suites. The 4-acre (1.6 hectares) outdoor water park features slides, a lazy river, basketball and volleyball pools, whirlpools, waterfalls, and a children's water play area. Restaurants, car rentals, bars, a casino, day spa, playground, and laundry facilities are available nearby. To discover more, please visit www.dellspolynesian.com. Family friendly resort with a large outdoor water park! Week 51 every year! Inquire today for more details!